I urge all Fijians to choose Fiji Airways whenever they fly. This was the call by the Prime Minister Voreqe Bainimarama at celebration of the arrival of the new ATR 42-600 for Fiji Airways subsidiary, Fiji Link at the Borron House last night. “And if they’ve moved away to other airlines, to give our national carrier another try,” Mr Bainimarama continued. “It’s not only about supporting our economy and keeping our money in Fiji. It’s not only because when the going gets tough as with a cyclone, the other airlines simply fly away. 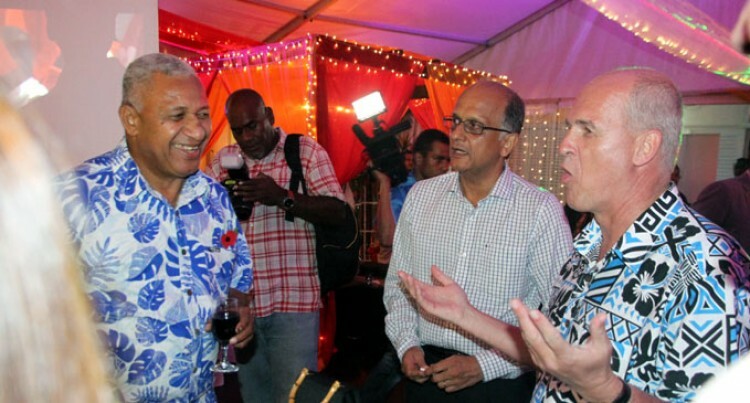 Mr Bainimarama added the planes’ livery and welcome by the cabin crew and the overall staff professionalism and integrity sent positive vibes in all facets of the once loss-making airline. The group has no doubt been growing from strength to strength evident in operating profits recorded. Within the six-months of this year, Fiji Airways Group recorded an underlying operating profit of $17.2m from January 1 to June 30. Mr Bainimarama continued: “The sight of Markareta Matamosi’s striking design as you walk along the airport concourse to board your flight. “Coming aboard at the end of …feeling as if you’ve already arrived home- the “Bula Vinaka” and the smiles. Mr Bainimarama paid tribute to the contribution the executives, management and staff had made in taking the airline to greater heights. “Because without you, without your understanding and foresight and sense of national pride we couldn’t have turned the airline around. Nor would we be soaring as high as we are now. Or able to give you a share of the profits that we are now making because of your dedication and hard work. “I also want to thank Stefan Pichler (Fiji Airways MD/CEO), Shaenaz Voss (Fiji Link general manager) and the rest of the management team plus Nalin Patel the Chairman of the Board of Fiji Airways. While highlighting the achievement of the regional airline, Ms Voss noted that even while they had set a plan to acquire only one plane this year, they have managed to get three. The third ATR 42-600 will arrive in December, she added.